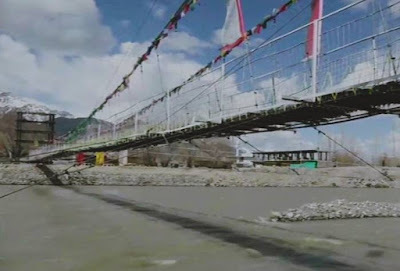 Home / Defence / Indian Army Builds Longest Suspension "Maitri Bridge"
Indian Army Builds Longest Suspension "Maitri Bridge"
Indian Army has built the longest suspension bridge over the Indus river in Leh in just 40 days and the bridge is named as "Maitri Bridge". The bridge was constructed by the combat engineers of 'Sahas aur Yogyata' regiment of 'Fire and Fury Corps' of the Indian Army. Q. What is the longest suspension bridge that the Indian Army has build over the Indus river in Leh called?